A £5 million development to reinvigorate the heart of Inverness with new homes and business opportunities began yesterday. A prominent derelict building on the city’s Academy Street – formerly occupied by Farm Foods – is to undergo a transformation. Over the next 16 months, the prime location will be demolished and turned into an eye-catching new development of homes for rent to local people and commercial retail units. A total of 23 of the 37 residential properties will affordable homes, a mixture of one and two bedrooms and will be available to rent from Highland Council. The remaining 14 will be mid-market homes for the Highland Housing Alliance. The development will also include four small commercial units on the ground floor. 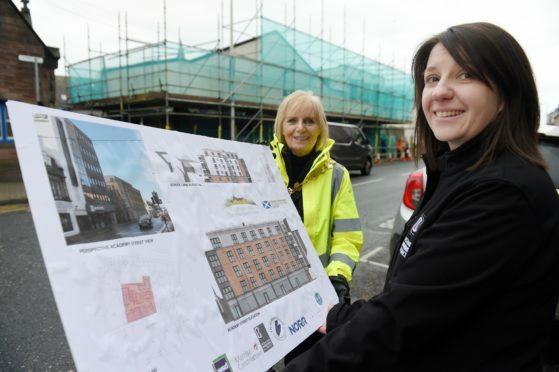 Inverness Provost Helen Carmichael is delighted that work has started, saying: “Academy Street is a historical gateway to the city centre and this project complements the work already underway to breathe new life into the area which has been crying out for regeneration and more homes. “By creating quality new homes for local people in the heart of our city we will give it a vibrancy which has been missing. “Good housing also contributes to stronger communities that benefit everyone living in them so this is really going to rejuvenate not just Academy Street but give a very welcomed boost to the whole of the city centre. As work started yesterday it was revealed that the new name of the development will be Wyvern House in tribute to the building’s history. In the 50’s and 60’s it was the premises of the SMT Vauxhall Garage and one of its best-selling models at the time was the Wyvern car. A Wyvern is a legendary creature with a dragon’s head and wings that often appears in heraldry and features in many Celtic images. The contractor is Morrison Construction and the work on site will be completed in early 2020. Gail Matheson, chief executive of the Highland Housing Alliance, added: “Redevelopment of this prominent site on Academy Street follows on from our recent success both across the road at 92-94 Academy Street and Raining’s Stairs. The development has been funded by a package including money from Highland Council, Highland Housing Alliance, the Scottish Government and the Highland City Region Deal. Councillor Richard Laird said: “This project complements the regeneration work already underway on Academy Street. Local government, planning and housing minister Kevin Stewart said: “Making sure everyone has a safe, warm and affordable home is central to our drive to make the country fairer and more prosperous.